I pulled up the carpet in my 300 sq ft, living room and found a concrete slab underneath. The slab has a smooth finish but was left with divots from tack-boards as well as glue and paint drippings. I am okay with some imperfections, but I want a cleanly finished result. 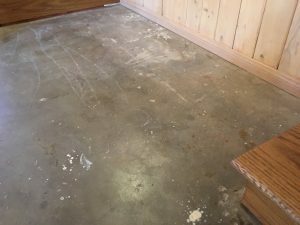 What is the best product for filling, sealing, and finishing the divots in my concrete floor? Joining us now is a listener, Sam. Or follow the Transcript below with pictures. Sam: My question is I’d like to fill in divots. I was surprised that there aren’t many products I’ve seen that allow you to match the color of whatever you put in a divot. Todd: It’s pretty difficult. I will give you a suggestion. Go with a gray concrete patch. That usually will blend in because of your concrete, it’s primarily grey. So if you use a gray repair, you’re going to be okay. Not only that, those divots, and I love it because you must be a golfer… using the word divot. 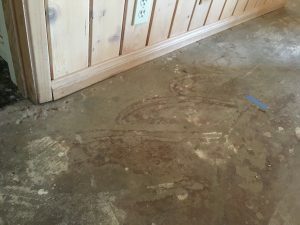 Todd answers how to best refurbish this Concrete Floor. Basically, that is where the tack strips were holding down the carpet. They pound a concrete nail and it takes a little bit of the concrete. So you want to go back over it with just a concrete repair. Then you might want to also, if they’re close enough to the wall, maybe upgrade your baseboards with a little thicker baseboard that comes out from the wall a little bit more. It’s going to be less noticeable. Eyes are usually drawn to the center of the room. So you should be okay with that. Todd: Let’s talk about some of the products that you were thinking about using. What have you found? Sam: Well, there’s Quick-set. There’s a concrete patch that has an adhesive in it. Then there’s a tube where you can pump it out. That is a self-leveling, which is good for big holes. Todd: Self-leveling is not something you want with this. You also mentioned you have cracks in the concrete. I’m going to give you my two cents on the cracks. Those are beauty marks, in my opinion. The cracks give it that real rustic look. I don’t think that you have to necessarily patch the cracks themselves. Todd: When was your home built? Todd: I’m going to share a concern I have. When you have a home built 1947, there were no moisture barriers. Having carpet and wood on that floor is probably not a good idea. 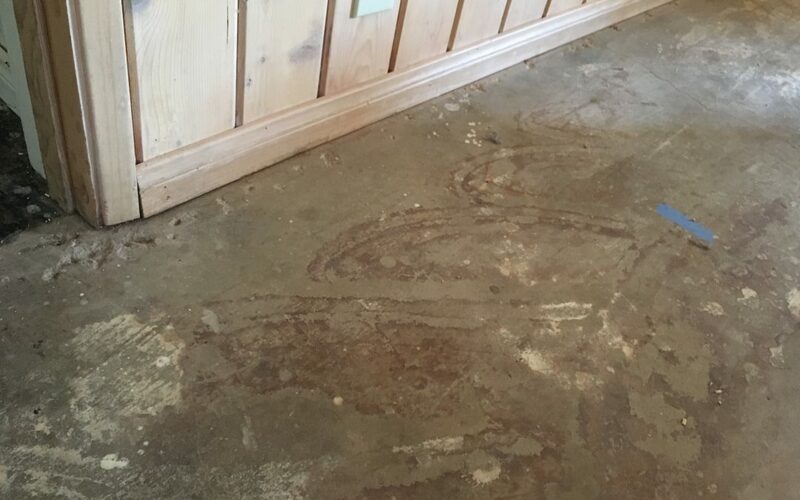 Having that floor exposed by having a concrete stained floor is probably your best option. There are divots in the concrete. We want to patch the holes. Nowadays, when you have a concrete floor you put a moisture barrier underneath the concrete. That means moisture cannot work its way up into that concrete. Concrete will, even though it’s dry, can have moisture in it. If you put hardwood over it or you keep carpet on it for a long, chances are you’re going to have a mold issue. You’re doing the smart thing by having it stained. Staining is about $2 to $3 a square foot with your product if you do it yourself. Probably six to $7 a square foot if you hire it out. This is one D-I-Y project that I strongly encourage people to do. It’s fun. The toughest part of this job, Sam, is going to be cleaning the surface. Sam: Thank you so much! Todd: If you’re interested in having your question answer on the show, go to AskTheContractors.com and leave us a question on the front page, like Sam from Los Angeles, did. Sam, Thank you again for joining us!